Evanston St. George High School "Dragons"
Evanston (population: 74,239) is located directly north of Chicago in Cook County and is part of the affluent region along the North Shore of Lake Michigan. The community's beginnings trace back to the 1830's as part of the Grosse Pointe territory, later to be renamed Ridgeville in the 1850's. Evanston did not incorporate until 1863 when it was named after the founder of Northwestern University, John Evans. A number of fraternities and sororities have their national headquarters in Evanston, as does the Women's Christian Temperance Union (WCTU). The childrens' toy Tinkertoys was born in Evanston. Both Metra as well as the Chicago Transit Authority (CTA) run trains thru Evanston daily to those in need of having to go into downtown Chicago or to other places that the services go to. US Highway 41 also runs along the lakefront. 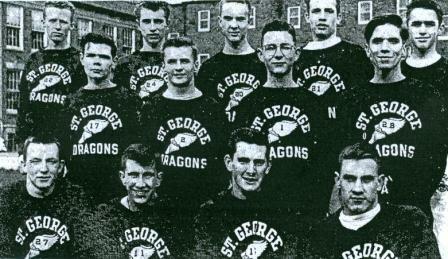 St. George High School opened as an all-boys' institution in September 1927 to 152 boys, staffed by the Christian Brothers community at 350 Sherman Avenue in Evanston. 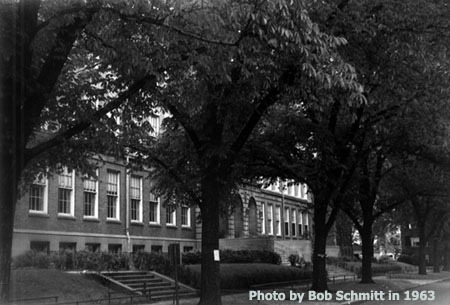 The school grew to as many as 1,100 students after World War II, continuing to be an option for those who wanted to send their teenage sons to a Catholic high school north of Chicago, but eventually Notre Dame High School for Boys would open in nearby Niles in 1955 and Loyola Academy moved from Chicago to nearby Wilmette two years later to give some competition to St. George. Due to declining enrollment, the Christian Brothers decided to close St. George in 1969. There is a website for St. George graduates to share memories and inform them of annual get-togethers. The address is www.saintgeorgehs.com. Name of yearbook: the "Georgian"
Name of newspaper: the "Dragon"
Blue and White, come on, let's go! We're going to FIGHT right through the foe! As side by side along we'll go! If you will FIGHT, FIGHT, FIGHT straight through! Come on and FIGHT, we're right with you! St. George offered football, track, cross-country, basketball, and swimming along with possibly baseball to its students. At one point, it also offered boxing and softball. The Dragons were a part of the Chicago Catholic League from 1927 until 1961, at which time the school decided to join the IHSA and become charter members of the Chicagoland Prep League with DeLaSalle, St. Mel, and St. Patrick. If you have any information or photos of some of the great teams, players, or coaches, please let us know at dr.veeman@gmail.com. Without question, this is the sport that put St. George on the map. Under Coach Max Burnell, the Dragons were 136-50-12 in the 20 years he was the head coach. Our good friend Tom Sikorski tells us that the school won two Prep Bowl titles, eight Catholic League division titles, had nine appearances in the Catholic League championship game, plus won two conference titles in the Chicagoland Prep Conference. 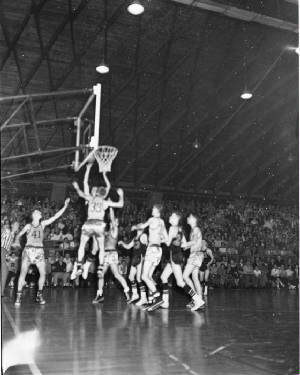 The Catholic League was not part of the IHSA in 1961 and its teams could not participate in state tournaments in any sports. Because they wanted to participate on the state level, St. George and three other schools left to form the Chicagoland Prep Conference. As a head coach, Burnell's teams won 303, lost 92, and tied 21 in 36 years of action at four different schools, including St. George. He was inducted into several different Halls of Fame: the Chicago Catholic League in 1972, the Illinois High School Football Coaches' Association in 1990, and Loyola Academy in 1994. Tom informs us that the earliest information about football at the school goes back to 1940, although it is believed to have gone back further. Here are the better marks of Dragon teams from 1940 thru 1968. Lost Catholic League Championship to Leo. Lost to Mendel in Catholic League playoff preliminary game. TREMENDOUS WORK BY THE DRAGON GRIDDERS!!! 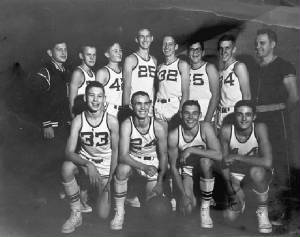 St. George's teams were up to the challenge to run the terrains of Chicagoland, even as the public school (Evanston Township) was contending for the state titles during the 1950's and '60's. The Dragons won a district title during the fall of 1962. We are in need of the coaches' name and any key performers. It is known the program was still in place at the school thru the final school year in 1968-69 as Pat Savage (later cross-country coach at DePaul) was at the helm. "St. George’s fabulous cross country program, under Coach Don Amidei, won seven Catholic League titles and two Chicagoland Prep titles. Their greatest star was Tom Sullivan." "I graduated from St. George in 1968 and ran cross country 4 seasons, '64, '65, '66 & '67, track for 3 seasons ('66, '67 & '68). The cross country coach for '64 and '65 was Robert Cinkus (sp?). He was the reading teacher, and one mean dude. He would follow us to and from Dawes Park with the top down on his brown Ford Galaxy convertible telling us to run faster. "Workouts varied from 10 to 15 miles per day, six days per week. We were wrecks by the end of the season. I believe that Coach Cinkus was the Coach in '62 and '63 also. Sorry if I don't have the spelling correct, but my yearbooks got tossed out while I was in the Navy. "Brother Edward was the coach for the 1966 cross country season. He was a pretty good coach, but he was transferred the next year. "We didn't have a full-time coach my senior year (fall of '67). Coach Don Amidei, who was coaching De Paul University at the time, but still teaching at St. George, would give me the work-outs for the team. We'd then jog out to Dawes Park and do the workouts pretty much on our own. We did have a faculty moderator, Mr. Huntoon (sp? ), who would meet us there, but he wasn't actually a coach. Coach Amidei was at our meets. On Saturday mornings we would meet with Coach Amidei in Lincoln Park and workout with the De Paul University team. Those were killer workouts." "Coach Amidei was the beach master at Foster (Avenue) Beach in the summer. During August of '67, he had us come down to Foster Beach and work out there." The Dragons, even though their school did not belong to the IHSA at the time, had one of the best runners in the nation in 1961. Tom Sullivan ran the 1600 in 4:02.4 (a converted time from the mile of 4:03.5 to 1600 meters), which was the nation's best until future Olympian Jim Ryun broke the record three years later at 3:59.0. Tom also had a time of 1:49.9 in the 800 meters that season, plus posted the best indoor time in the 1000 yards at 2:10.5 (also set in 1961), which lasted 11 years. For his efforts, Sullivan shared the Track & Field News' Athlete of the Year award that year with Ulis Williams (a 440-yard runner) from Compton, CA. Even though we haven't been able to find anything close to a win-loss record and names of coaches, there was basketball at St. George. 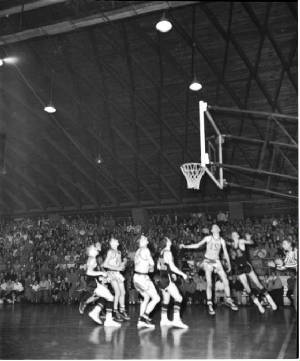 In fact, its' lightweight team won the Catholic League title in 1938-39, while two varsity teams either shared or won a title outright as the best in the league. One of its alumni is Tony Barone, who graduated in 1964 and attended Duke University, where he was named Academic All-American. Barone would stay involved with the game as an assistant coach at three Chicago Catholic League high schools (including St. George), before going to the collegiate level as an assistant at Duke and Bradley, plus was head coach at Creighton and Texas A & M. Barone also served as interim head coach of the Nashville Grizzlies after serving as their director of player development. If you know more about the Dragons' basketball program, please contact us. During the spring of 1943, St. George was one of seven Catholic League schools that played softball instead of baseball as an experiment on account of the success that Catholic Youth Organizations were having with the sport. The Dragons were crowned champions with a win-loss mark of 6-1, in spite of the fact that half of the Catholic League games were cancelled due to the rain and inclement weather that spring. The Dragons took to the pool along with other Catholic League teams to compete, and came away with one conference title. Names of coaches and other swimmers are unknown. St. George won the following senior golf titles. -- John Leims (class of 1940) -- Was involved in the US Victory at Iwo Jima in the Pacific Theater during World War II. Wikipedia has an indepth biography on him: http://en.wikipedia.org/wiki/John_H._Leims. -- Henry Hyde (class of 1942) --Served in US Congress from the sixth District of Illinois (near Chicago). -- Max Burnell, Jr. (class of 1958) --Quarterback of the Dragon football program under the guidance of his father/coach (Max, Sr.), later went on to play collegiately at Notre Dame, where he graduated with a Bachelor of Science degree. Today, Max Jr. is the president and CEO of Southern Sales Systems, a leader in food service brokerage located near New Orleans, LA. -- Chuck Erlenbaugh (class of 1963) --All-State football player in 1962 at guard. Went on to play at Purdue University as a teammate of pro football Hall of Famer Bob Griese, leading the Boilermakers to victory of the 1967 Rose Bowl over the University of Southern California (USC). Erlenbaugh returned to the prep game after college as a teacher and coach at Loyola Academy in Willmette in 1969, staying there long enough to teach physical education, plus coach football, tennis, and volleyball, in addition to being the assistant athletic director over a 30-year period. He was named to Loyola's Athletic Hall of Fame as well the Chicago Catholic League's Hall of Fame. "Two things. Noted Alumni, you mentioned Max Burnell Jr. He graduated in 1958. You also pictured the winning Cross-Country team, 1958. Thanks, I'm the one in the last row, far right." "I was on the swim team from 1962 thru 1966. 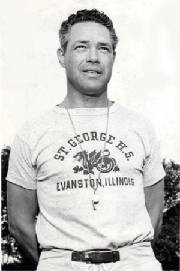 Coach McCormick was the coach in 1962. Coach Jerry Richards was the coach from 1963 to 1966 and beyond. We had some decent swimmers on the team and actually made the IHSA district finals in 1966 in the 400 yd free relay (John Wimer, Mark Mikucki, Al Biedowicz, Tom Heineman). John Wimer was a Freshman and was extremely fast; he went on to state finals in the 100 free when he was a sophomore and beyond. Coach Richards did a really good job bringing the team along and having us compete with some strong suburban teams. I remember beating Lane Tech when I was a Freshman." "1953-54 Swimming: School took 5th place in Catholic League City (Senior) Finals at Loyola Academy (Loyola U) pool at Devon or North Campus, Spring 1954. "1954-55 Swimming: School took 2nd Place 50 free final (team Capt Robert Johnson '57) in 1955 year and 5th place in 1956 same event. "Robert Johnson and Paul Fee were only students to be awarded "major letter" as freshmen in 1953-56 swim seasons...qualified for City Finals. "1953-57 Tennis: failed to qualify from '53 to '57 under Brother Jerome; Tennis Capt Robert Johnson. "Chuck Lewandowski ("Lewan") as he was called, was the swimming coach. Also coached football with (Max) Burnell." Couples from left to right: Mr. and Mrs. James C. Brodt, Mr. and Mrs. James Delaney, Mr. and Mrs. Laurence Gillarde, Midshipman 2nd Class George McGurn and Miss Eileen Ryan, Mr. and Mrs. Lawrence Meyer, Mr. and Mrs. Richard Seneker, Mr. and Mrs. Francis Wernhewer, Mr. and Mrs. Paul Wetsel, and Brother Luke.